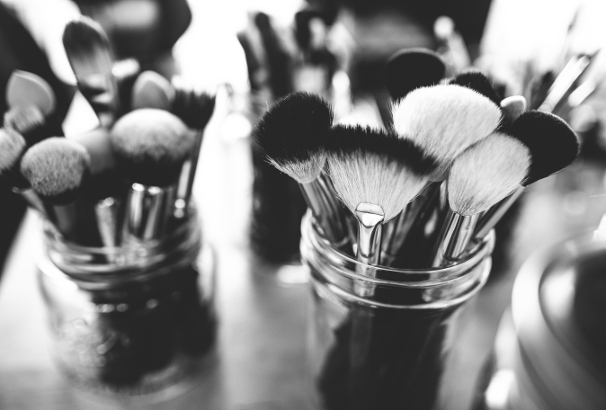 Wanting to start a beauty blog can be exciting, but learning how to start a beauty blog can be intimidating if you are not sure what you are doing. You can learn a lot by following other beauty bloggers, such as Brand and Beauty, The Sunday Girl, Beauty Banter, The Wanderlust Project and Gorgeous in Grey, but we’re going to give you a few easy-to-follow instructions on how to start your own blog as well as tips on how to grow and monetize it. This post will cover how to register your domain name and purchase hosting for your new beauty blog, how to pick a WordPress theme and install some plugins which work with Pinterest and Instagram, how to take great looking photos for your blog, how to get traffic to your website using social media and how to make money from your beauty blog. You need a website to publish your blog posts on, and you need a server to host that website on. 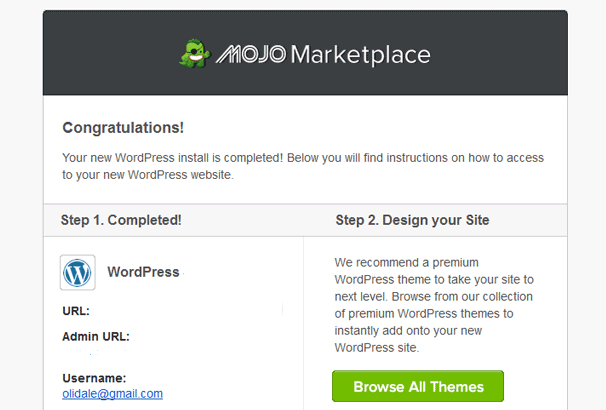 That’s what we’re going to learn how to set up with Bluehost and WordPress. 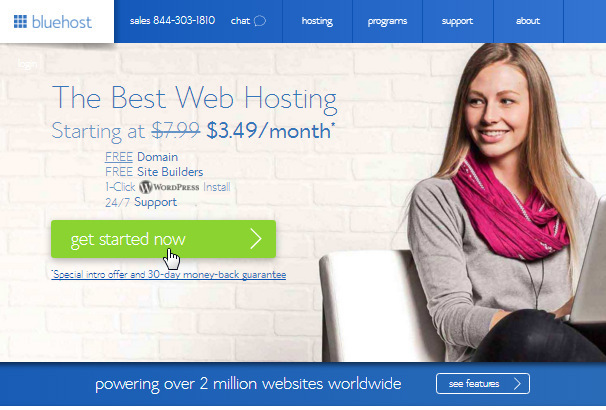 We’ll learn how to purchase shared hosting at Bluehost before learning how to install WordPress on it, choose a theme to make your blog look beautiful, choose some plugins and finally get started with your new makeup or beauty blog. If you haven’t thought of a name for your blog, yet, now is the time to do so. Enter it as one phrase in the New Domain box once you do. 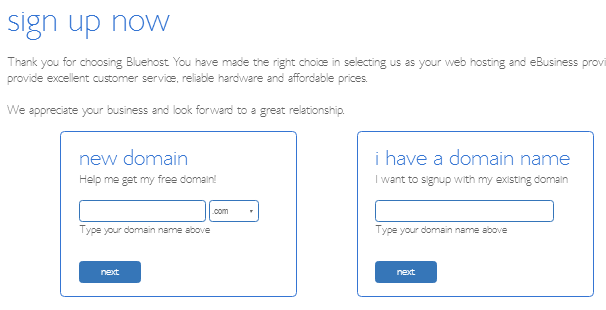 Click Next to see if that domain is available, and try another one if it isn’t. Move on to the next step once you find a domain name you like. The next part is easy and should already feel familiar to you if you’ve ever made an online purchase. Enter your name and billing information. Next is the package information. 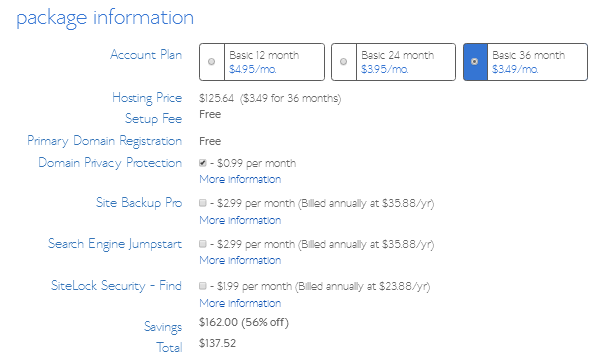 The boxes for Site Backup Pro, Search Engine Jumpstart and SiteLock Security – Find are usually ticked by default. 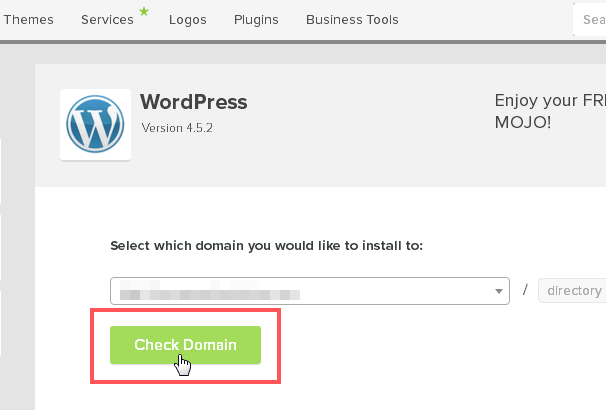 Feel free to untick these as there are plenty of free and more reliable ways to secure your WordPress site and create backups for it. You should, however, make sure you leave Domain Privacy Protection checked. 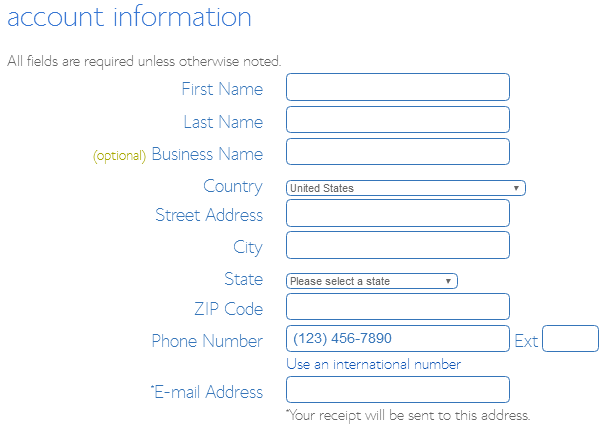 Anyone can gain access to the billing information you entered in the previous step if you don’t purchase this service. 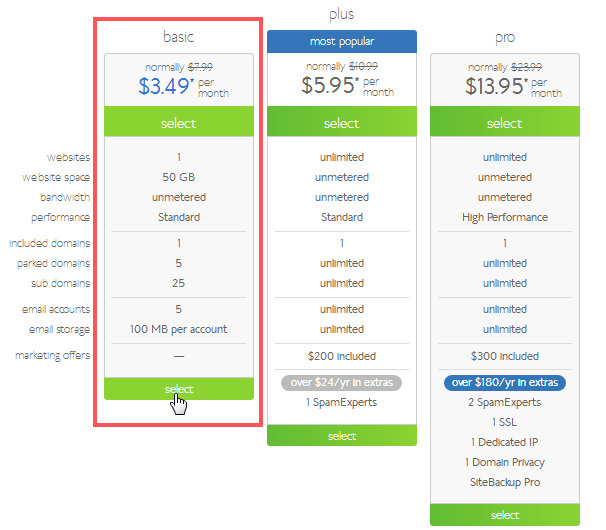 Next is the final step in purchasing a server from Bluehost. Enter your credit/debit card information if you want to pay by card. 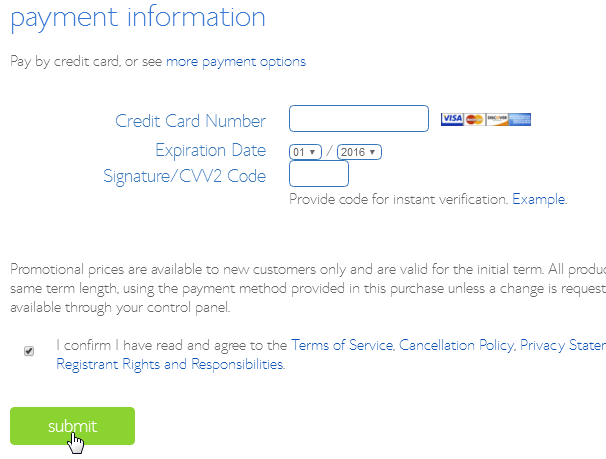 Click More Payment Options if you want to pay with PayPal. Confirm that you’ve read the Terms & Conditions, and submit your order. Once that has finished you now have your brand new blog installed! 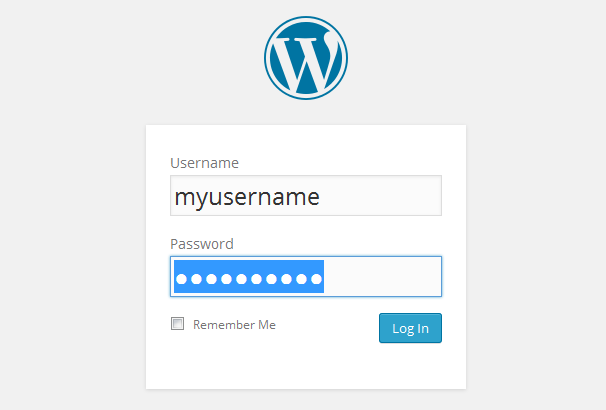 You can click “View Credentials” to see your blog login URL and you will also receive an email with links to your new blog and the admin page link. 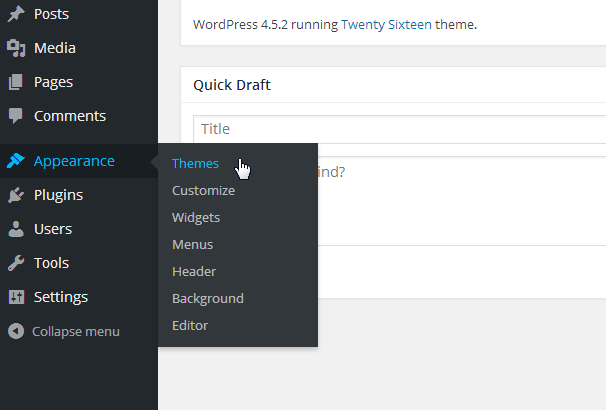 Click the link for the Admin URL and you can login with your username and password and begin choosing a theme. 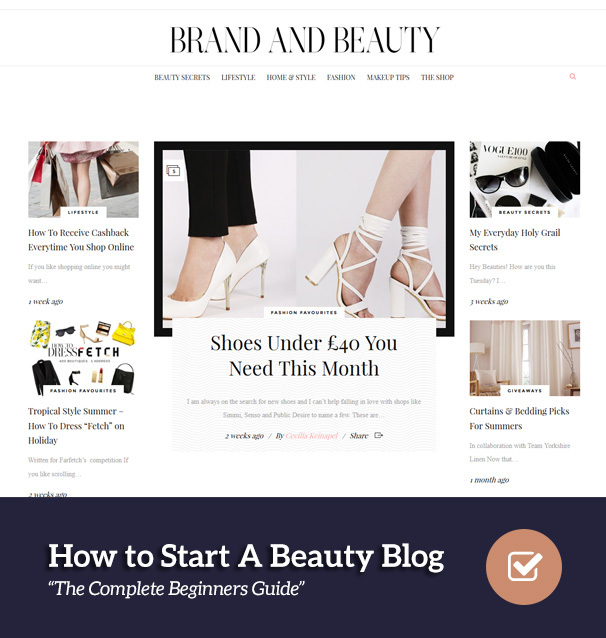 The top beauty blogs have at least one thing in common—they all use beautiful website designs. 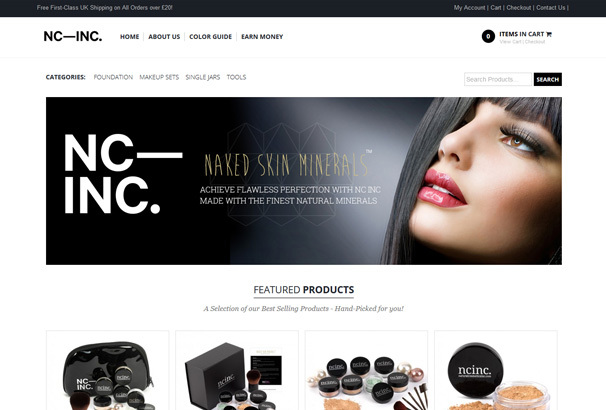 Take a look at our collection of over 50 WordPress Themes for Beauty Blogs for a big collection of suitable themes. 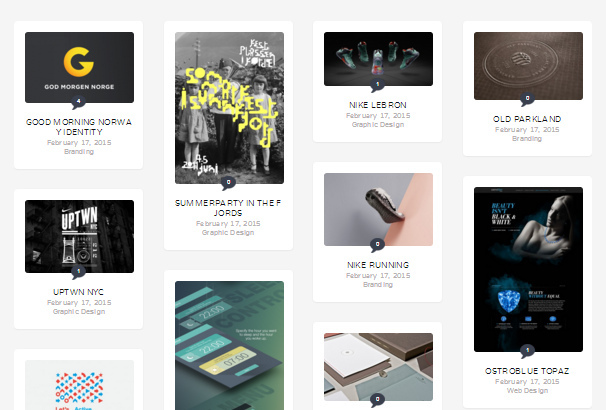 Stacker is a Pinterest-style theme available here at ThemeFurnace. 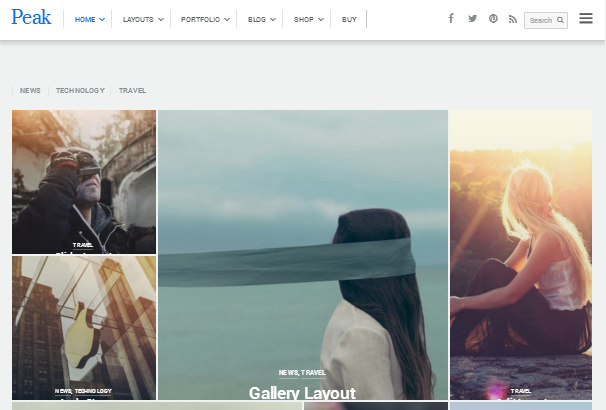 It’s a stunning, minimalist theme that relies on beautiful imagery, making it an ideal theme for beauty blogs. The homepage uses a masonry grid style that lets you use images of different sizes, giving readers a stunning way of consuming your content. Narcos is a powerful multi-purpose theme by TeslaThemes, and it’s quickly becoming one of the developer’s most popular themes. It’s a theme that can be used for a variety of different purposes. It’s a also great theme for beauty bloggers who intend on using high-quality images. 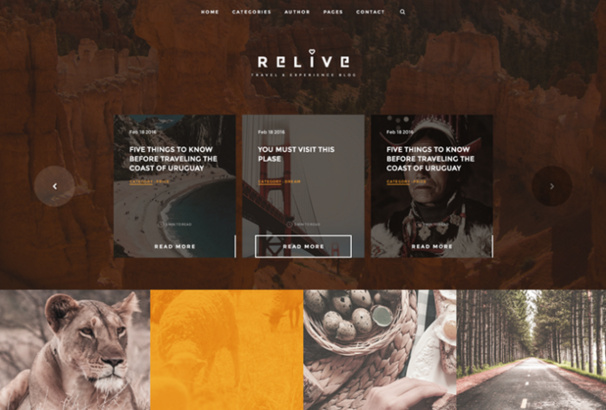 Relive is a “storytelling blog theme” by TeslaThemes. It’s built to create an “immersive reading experience,” making it a useful tool for beauty bloggers with vibrant personalities. 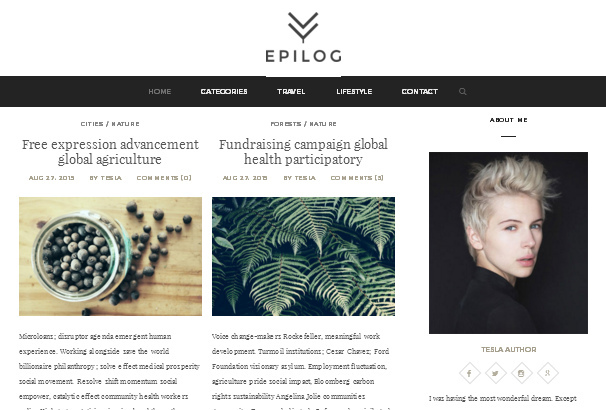 Epilog is a stunning blog theme by TeslaThemes. It uses a minimalist, modern, clean-cut style and uses different post formats to give you plenty of different ways to share your knowledge on beauty, makeup and style with the world. Peak is a minimalist blog theme by Themify. It uses a masonry grid on the blog page, creating a stunning way for your readers to check out your latest beauty tips and insights. 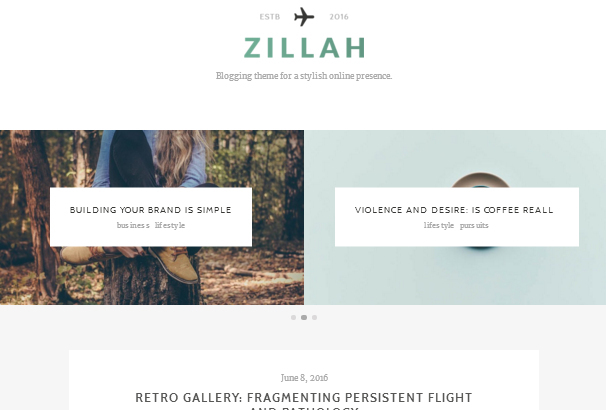 Zillah is a simple WordPress theme that uses a minimalist design. 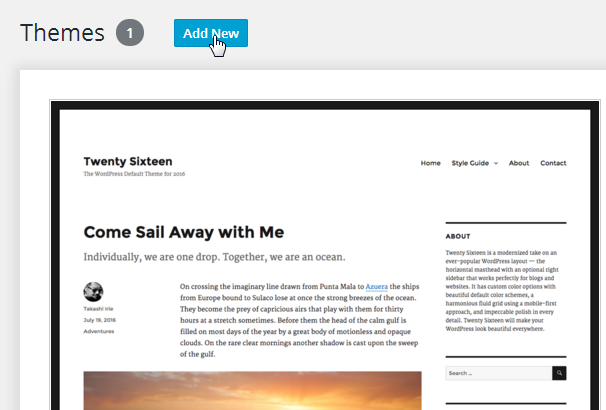 It gives bloggers a stylish way of sharing their latest posts. Beauty bloggers can use it to display their latest posts in an aesthetically-pleasing way. 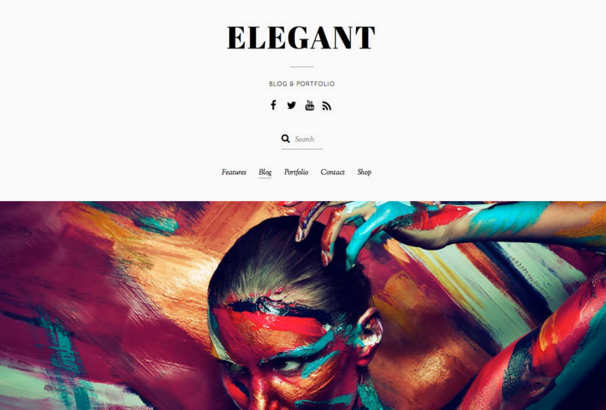 Elegant is a simple and elegant theme by Themify. It was built for bloggers that rely on style, and that includes beauty bloggers who use stunning, chic and glamorous imagery. 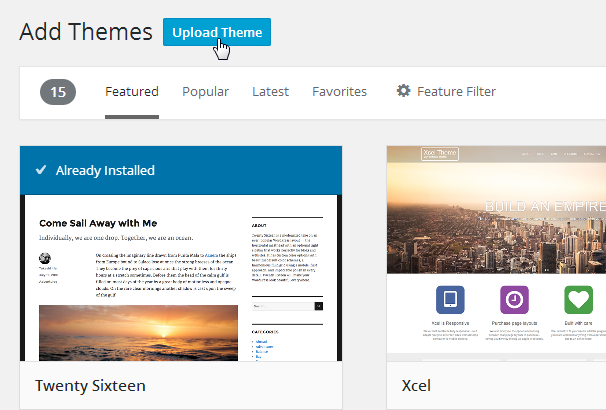 Infinite is a simple theme by Themify. It was designed for fashion photographers but can also be used by beauty bloggers. Its fashion photography-intended design may give you motivation to up your photography game. 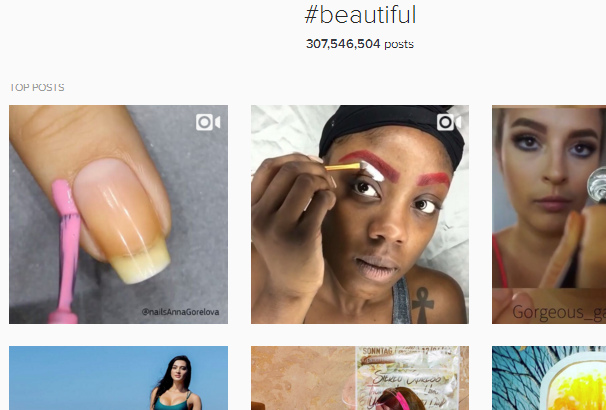 Instagram and Pinterest are the hottest social media platforms beauty bloggers can use. This line of blogging relies on imagery to grab a reader’s attention, so it’s only natural for these highly visual platforms to be dominating this niche. What does that mean for your blog? 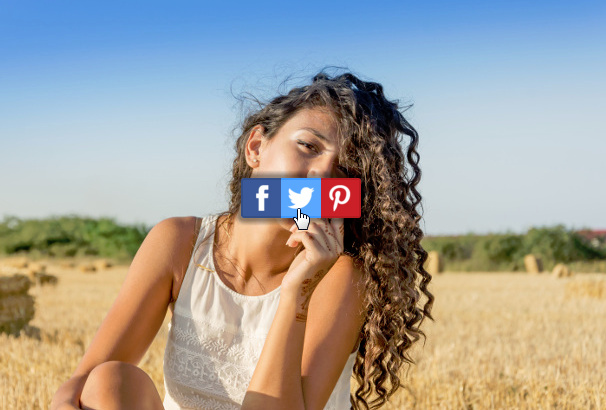 Well, not only should you get to know more about how these platforms work, you should also consider displaying feeds of your latest Instagram and Pinterest posts and make it easy for your readers to share your work on these platforms. Here are a few plugins that allow you to do that. 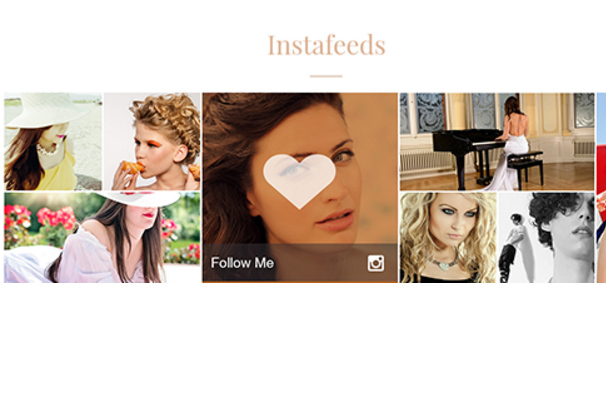 Instagram Feed lets you display a variety of different feeds from Instagram account using a simple shortcode. You can display your own feed, the feed of any non-private account, the feed of a particular hashtag and more. This simple plugin displays a Pin It button on every image you post on your site but only when a user hovers over it. 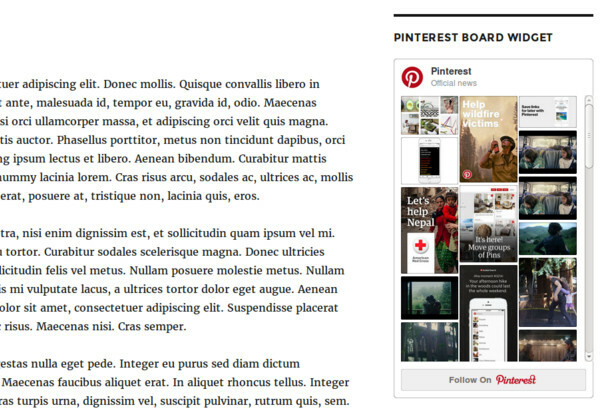 This allows your readers to share your images and posts on Pinterest with the simple click of a button. You can stylize the button to use white text against a red background or red text against an off-white background. 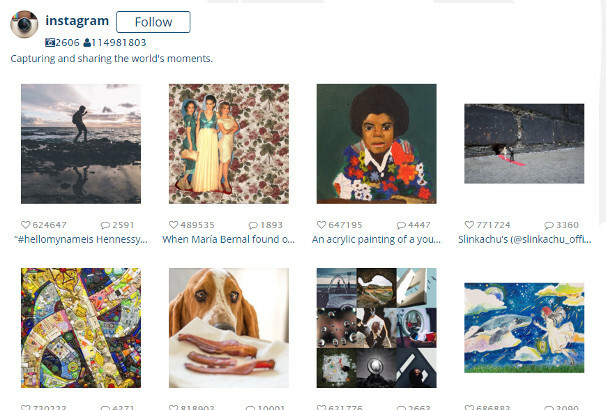 This is another plugin that lets you display Instagram feeds from a variety of different users and hashtags. 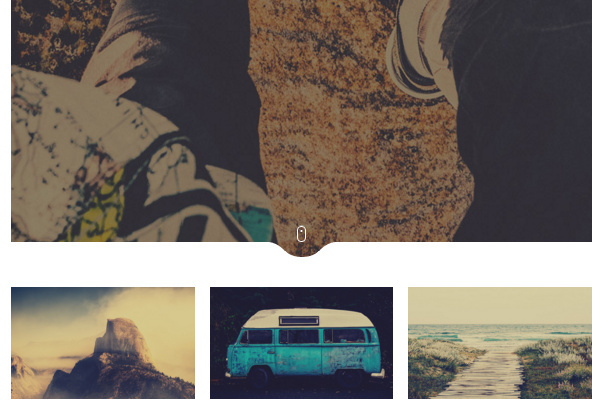 You can display your feeds in a variety of different styles, including masonry grids and blog styles. 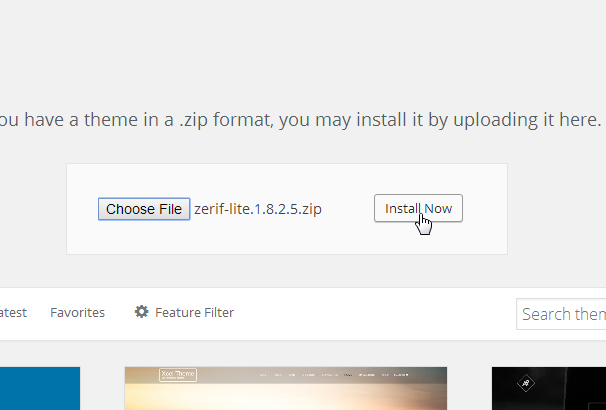 AccessPress Instagram Feed is another plugin that lets you display your Instagram feed on your site. 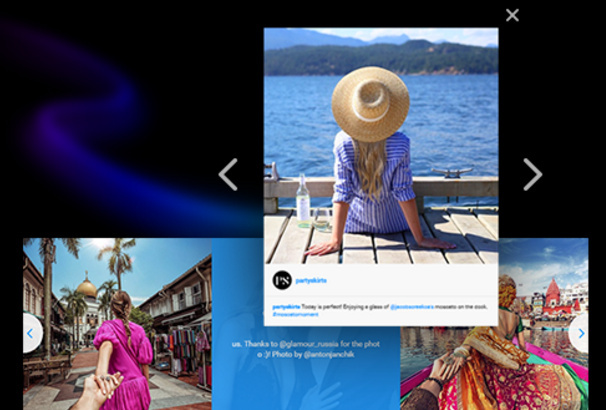 You can display your feed in a variety of different ways, including masonry grids and sliders, and you can even have your images display in lightboxes when your readers click on them. InstaShow Lite is another plugin that lets you display your latest Instagram posts in a feed. It lets you display your feed as a slider using a simple shortcode. It also lets you set your caption as an overlay and displays your photos in pop-up boxes when users clicks on them. Pinterest by BestWebSoft is a simple plugin that lets you display your Pinterest feed and a Follow button as a widget in your sidebar or footer. SumoMe is a powerful social sharing plugin. 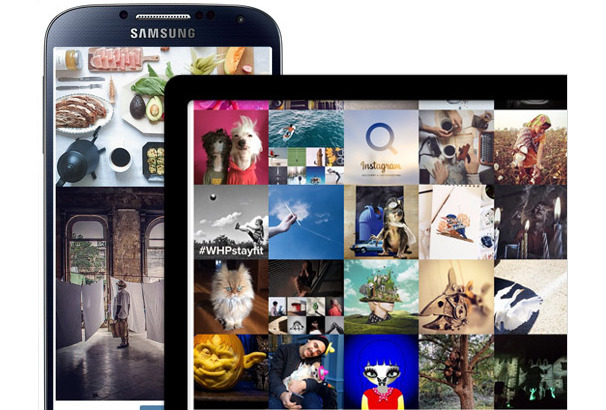 One of its features includes the ability to add social sharing buttons on your images when users hover over them. This gives your readers an easy way of sharing your content while also allowing you to increase your social media reach. You’ll eventually gain a following that can’t wait to read your latest posts, but beauty blogs rely on imagery to attract new readers, especially in the beginning. You need to make sure your images are so bold, so beautiful and so stunning that Pinterest, Instagram and users from other social media platforms can’t help but click on them to see where they’re from. This is where it starts, but exactly where you start depends on your budget. If you have a smartphone, especially a flagship device from a major electronics brand, don’t be afraid to use it alongside photo editing software while you’re starting out. If you choose to buy a camera body that comes with a lens kit, you’ll probably find yourself with an 18-55mm lens, which will suit you just fine while you’re learning the ropes. Try upgrading to your camera brand’s latest 50mm 1.8 lens when you can. Don’t worry about upgrading the body as much. Just focus on building your lens collection. Adobe Photoshop and Lightroom are great options to choose when it comes to photo editing software. You can subscribe to a cost-effective plan for these programs from the Adobe’s Creative Cloud. The last main thing you may need to pick up is a USB card reader for your computer. DSLR cameras use SD memory cards to store images. This is what you’ll use to transfer images between your camera and your computer. If your computer doesn’t have an SD memory card slot, you’ll need to purchase a USB card reader for $5-$20. Natural light is the best type of lighting to use in most cases. Take your images near a window. Not one that’s in direct sunlight but at least one that’s letting a lot of light into the room. There are many amateur and professional ways of producing artificial light when natural light isn’t available. This includes plenty of inexpensive DIY solutions. Don’t worry about trying to come up with the perfect shot when taking images. Instead, take a few different images and choose your favorite later. Take images at different angles, with and without props, with different lighting, etc. Beauty blogger Chelsea from Sunny with a Chance of Sprinkles reports seeing an increase in her referrals from Pinterest when using vertical images, so try mixing things up a bit and taking a few vertical images every now and again. Instagram is growing daily, if you are a beauty blogger its a great way to build a following and try to drive some traffic back to your blog. Experienced beauty bloggers and Instagramers recommend posting several times a day, but they also recommend going for quality over quantity, so don’t feel pressured to get something out if you aren’t able to produce a quality image at the time. Most beauty bloggers don’t waste their time with professional cameras when it comes to Instagram. They save that quality for their blogs. Instead, make sure you’re using a flagship device from a major smartphone brand and post regularly. They also recommend you to follow, like and interact with your favorite beauty brands. These brands may recognize the following you have over time and may want to strike up a partnership with you and your blog. Don’t forget to interact with your followers as well. Ask them what they had to eat that day when you post a food pic, their go-to beauty product when you post a behind-the-scenes pic and other things of that nature. Don’t forget to include hashtags. Here’s a post from Post Planner explaining the 25 most popular hashtags to use to gain new followers. Lastly, you can use a service like Iconosquare to keep track of your marketing efforts on Instagram. We already slightly covered this in the last section, but reviewing products is a great way to monetize your blog. It’s cost effective when you build relationships with brands as they’ll send you products to review so you don’t need to purchase them. If you are just starting out, you won’t have a large audience so you should focus your attentions on smaller brands – a great place to find these is on Etsy, reach out to small makeup brands or other related beauty products and see if they would like to send you some samples in return for reviews of their products. As your blog grows, and you can demonstrate you have a larger audience – you can then contact larger well-know brands and show them the reviews you did of the smaller brands. Eventually, as your subscribers and followers grow, you could be lucky enough that people start contacting you for reviews. At that point you could start charging a set amount to review products for your blog, this would also help keep you in free products for your personal use. Amazon has a good affiliate program, signup for that and can start linking to products sold on Amazon and earn money for any sales you refer. Also check out your beauty stores and brands online who make have their own affiliate program you can use to receive commissions when your readers purchase the products you review using your links. Affiliate marketing is just one of ways you can monetize a blog. You can also display ads throughout your site. These can be from a service like Google Adsense, or you can offer brands ad space on your site. The last way to monetize a blog is to create your own products. This can range anywhere from a book to a course and even your own physical products. Hopefully, you have all of the basic information you need to start a well-designed beauty blog that’s ready for monetization. Just remember that this is a niche of blogging that relies heavily on personality, so don’t be afraid to let your lively, vibrant personality to show through your design, imagery style and copy from the get go. If you need more help with starting your beauty blog, we have gathered together the following resources for you! Hi! Don’t forget about maintenance and customization, to guarantee your blog’s stable and smooth work, up-to-date issues solving, speed, security and constant modernization.